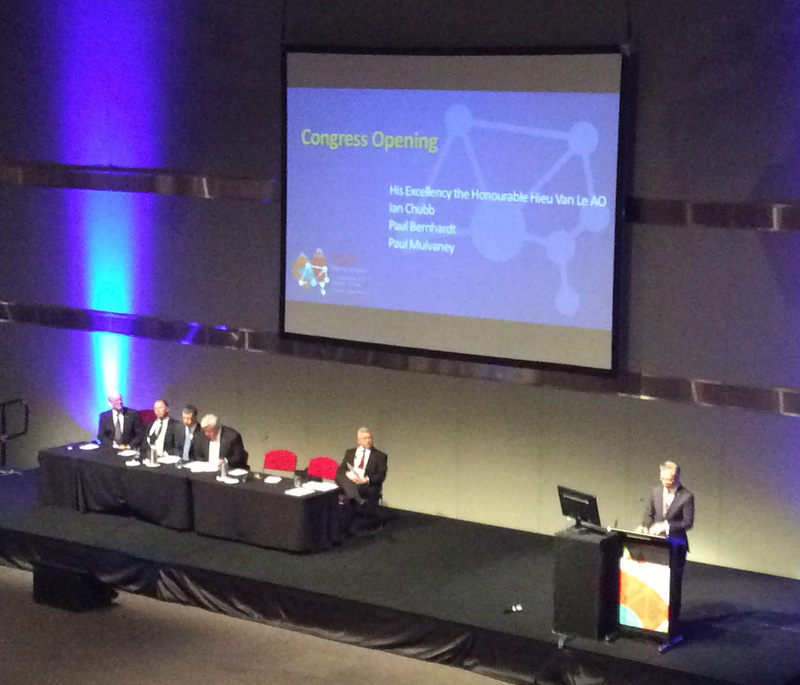 The conference was officially launched by Congress Chair, Joe Shapter, who introduced the first speaker, Karl, the founder of the Paitya Dance Group in Adelaide. Following the welcome to country, Karl performed the didgeridoo, sharing Kaurna knowledge and culture through traditional sound and song. With the official business over and done with, it was now time for serious learning! 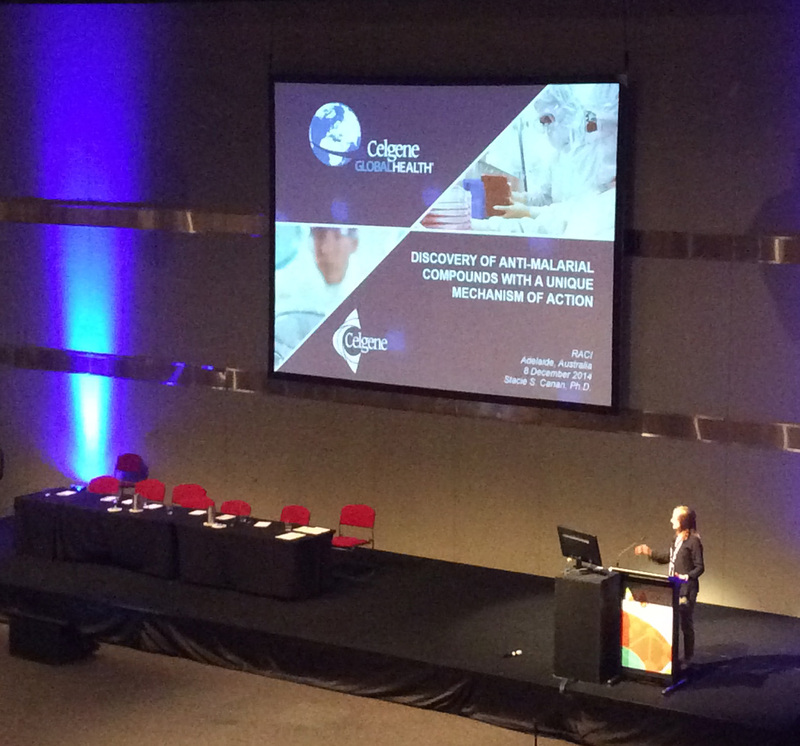 The first plenary presentation by Stacie Cannan from Celgene Global Health was about current drug discovery efforts to combat neglected diseases. She focuses primarily on malaria, which kills more than 600,000 per year, the majority of whom are children under five. In her talk, she discusses a novel class of anti-malarial compounds they’ve discovered that simultaneously optimizes potency and physicochemical properties. She profiles this chemical series against various strains of malaria and assesses the toxicity profile of lead compounds. 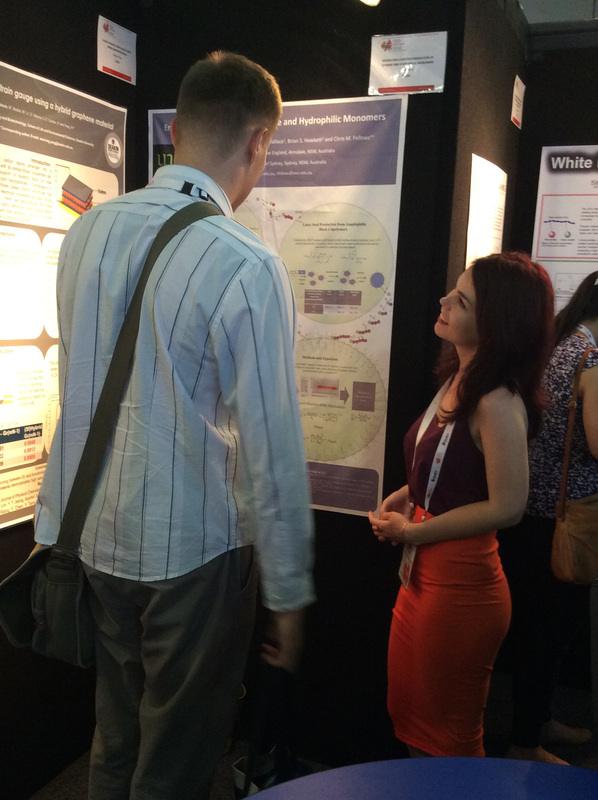 She also discusses the challenges and advantages of phenotypic drug discovery as a medicinal chemistry approach. The next session I attended was on a pet topic of mine, namely G-protein coupled receptors (GPCRs), which I’ve studied thoroughly the last few months during my VC Scholar Special Project in Armidale. But unlike the computer modelling and molecular dynamics simulations that I’ve performed on GPCRs recently, this presentation involved the use of peptides as therapeutic molecules that target GPCRs. 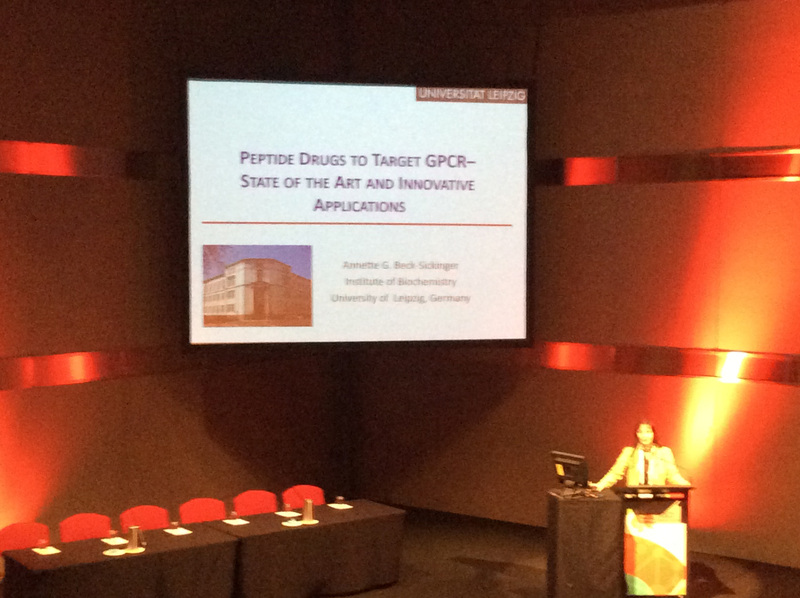 Annette Beck-Sickinger from Leipzig University presented both theoretical and experimental work that was very interesting, particularly the potential use of peptide drugs to treat diabetes, obesity and cancer. By sheer luck and coincidence I found myself at a fascinating computational chemistry talk by Mark Waller from the Center for Multiscale Theory and Computation, WWU Münster in Germany. Although most of it was too technical for my young undergraduate mind, I was deeply engrossed in both the language and methodology involved in modelling complex chemical systems. I found the concept of “adaptive hybrid metaheuristic optimizers” particularly exciting! From my understanding of Mark’s talk, density-based partitioning offers better alternatives over distance-based or number-based partitioning of systems during QM/MM simulations. Apart from that, it was all a bit of a blur … but in a good way! Although this talk looked pretty good on paper, it definitely didn’t live up to my expectations. Despite computational modelling, particularly molecular dynamics, being my bread and butter, the applications to advanced materials and industrial chemistry simply did not interest me whatsoever! Worst of all, the presenter had the most annoying habit of pointing the clicker constantly in concentric circles throughout the whole presentation, that I couldn’t even look at the projected screen for more than a few seconds or else a headache would ensue. At least this experience cemented my path towards the biological or medicinal aspects of chemistry, rather than materials chemistry. I then attended a PhD presentation by Charlotte Rouse from ANU, a welcome change from the more advanced talks throughout the day. Her thesis was based on nano-scale structures and the effects of modifying cyclodextrin “machines” on biological materials, particularly peptidic structures. Very interesting. The last formal presentation I went to on Day 1 was on something completely unfamiliar to me so I thought why not? Googling “norbornane” was the first thing I did after taking my seat in the very spacious Hall C. Also known as bicyclo[2.2.1]heptane, norbornane is an organic compound and a saturated hydrocarbon with chemical formula C7H12. Thanks Google. Meanwhile, Shane Hickey, a PhD student from Deakin University discussed the problem of antibacterial resistance, particularly ‘superbugs’, and the development of novel antibiotic compounds based on norbornane. Another interesting talk to end the day. Anyway, enough chemistry. More chocolate eating! And if that’s not enough action for one day, I decided to join some students for some well earned beer and pizza while playing trivia at the Nexus Multicultural Arts Centre. The event was organised by the RACI Medicinal Chemistry and Chemical Biology Students so of course there was a whole round devoted entirely to chemistry. A fun night was had by all, especially our team because we won! I got to take home a bottle of cider, tomato chutney and a bag of lollies when the prizes were divided up. 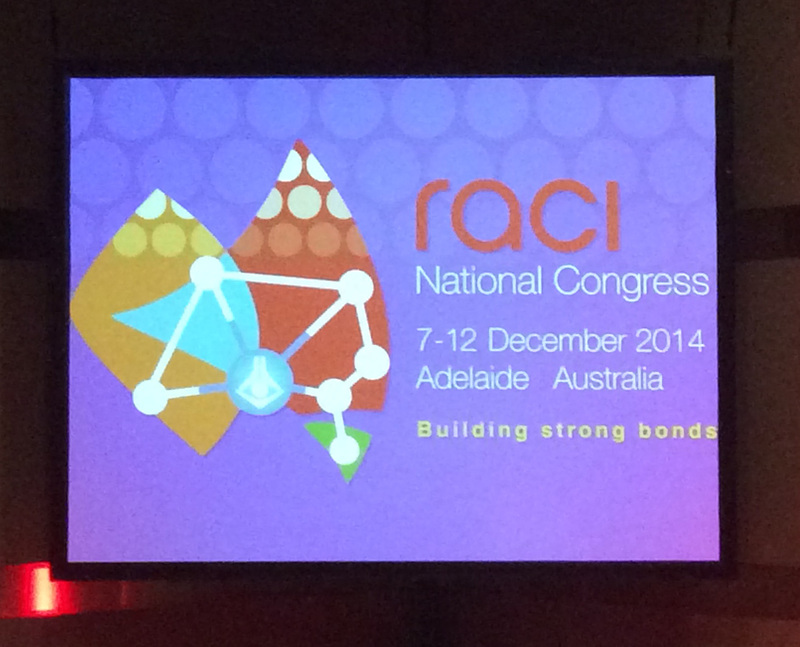 Not a bad start to RACI14.